This Time to Talk day it’s time to start a conversation about mental health. Long or short, a chat about mental health helps break down the stigma surrounding the topic. Mental health problems affect one in four people in the UK, but we are still afraid to talk about them. Time to Talk day encourages people to talk about mental health. For people with a disability along with their friends, family and carers, mental health problems can be more common. Last month research revealed that young carers are more likely to experience mental health problems than their peers without caring responsibilities. This year it’s all about bringing together the right ingredients to start a conversation about mental health. Small gestures can create big change. 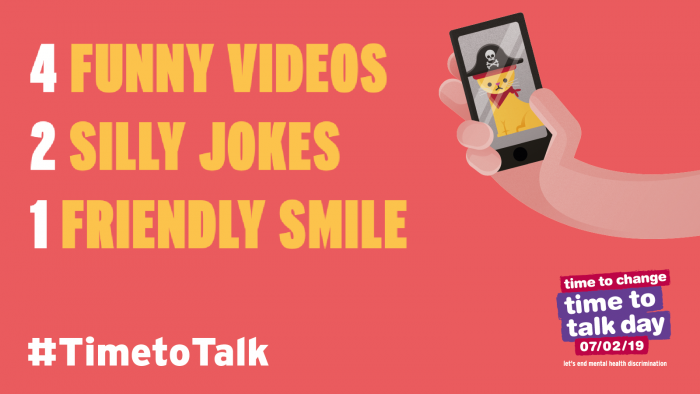 Sitting down for a cup of tea and a chat, sharing a funny video with someone or talking to someone about how you are feeling are all perfect ways to start a conversation on mental health. Saying hello to a stranger at the bus stop, texting a friend to check in or asking how someone close to you is can all make a big difference in someone’s day. Even sharing a fact about mental health on social media can help broaden someone’s horizons. The organisation behind Time to Talk day, Time to Change, have created helpful resources to give you the ingredients you need to start a conversation on mental health. If you or someone you know is struggling with mental health problems it is important to seek help. Speak to a friend, family member or carer, contact a mental health charity, or call Samaritans on 116 123. How are you starting a conversation about mental health this Time to Talk day? Let us know on Twitter and Instagram. Be the first to comment on "Make time to talk about mental health today"